Prior to the international conference PURPLSOC in July 2015, a two-day preparatory workshop will be hosted at Danube-University on November 14/15, 2014. During the last two decades many patterns, pattern languages, and case studies describing their successful application have been published in a number of different disciplines. However, this still feels like the tip of an iceberg, with many open scientific questions, e. g. regarding the theoretical background of patterns and the practical implementation of pattern methods in research and teaching. The workshop is intended to stimulate the attention for pattern related work, both in the scientific community and the wider public, by showing its broad applicability and fruitfulness. Increase of the understanding of living properties and their processes: motivation, empirical evidence, application etc. These submissions form the basis for deeper discussions in smaller work groups whereby the authors are expected to present their ideas in a short presentation. Taken from the ideas of Christopher Alexander, the workshop will focus on the many ways in which patterns can be applied to a wide range of working and learning environments to support life, wholeness, and beauty. The preparatory workshop will foster the central idea of the PURPLSOC Conference: applying the pattern approach to many disciplines and areas of the life-word. Life as a complex web of relationships, as an emergent process over time, and as a human feeling will be discussed in such different fields like complexity theory, pattern theory, learning, architecture, sustainability, and social activism to name just a few of the interesting research questions. We want to demonstrate how the Alexandrian pattern approach can be applied to many contemporary societal discourses and debates. A detailed schedule will be announced in September. We will publish the revised workshop papers. Abstracts will be broadcast as audio-recorded podcasts prior to the conference, starting January 2015. Authors are required to submit an extended abstract (2-4 pages long), that will undergo a blind review process, until August 15th, 2014. Full papers (approx. 15 pages long) are due October 30th, 2014 (two weeks before the workshop). After the workshop the authors will have time till January 7th to revise their papers. Papers must be submitted to papers@purplsoc.org. All papers must conform to American Psychological Association 6th Edition format. All post-workshop submissions will undergo a rigorous double blind review process. For any question, please contact info@purplsoc.org. We are still at the beginning of our discussion and open for suggestions of topics and other recommendation. Please distribute the attached fact sheet for the workshop to your colleagues and other interested people. 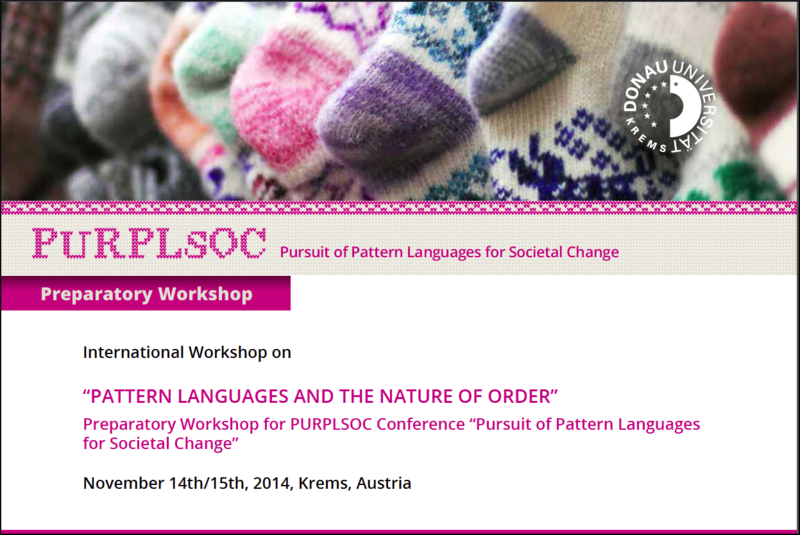 Join us in building a movement for pattern languages for a societal change (PURPLSOC). Contact any member of the program committee or send an email to info@purplsoc.org. Dieser Beitrag wurde unter Ankündigung, Forschung abgelegt und mit CfP, English, Pattern verschlagwortet. Setze ein Lesezeichen auf den Permalink.